Two World Trade Center, also known by its street address, 200 Greenwich Street, is a new office building on hold and is part of the World Trade Center reconstruction in New York City. When completed, the tower will be located on the east side of Greenwich Street, across the street from the original location of the Twin Towers that were destroyed during the September 11, 2001 attacks. The 79-story building was designed by Foster and Partners, London. The building will have a height of 1,270 feet (387 m), with a tripod-shaped antenna that allows the building to reach a total height of 1,350 feet (411 m). In comparison, the Empire State Building's roof at the 102nd floor is 1,250 feet (381 m) tall, and its antenna is 1,472 ft (448 m), and the original 2 World Trade Center (often referred to as the "South Tower") was 1,362 feet (415 m). The structural engineer for the building is WSP Cantor Seinuk, New York City. The Curtain Wall/Cladding consultant for the building is Permasteelisa SPA. 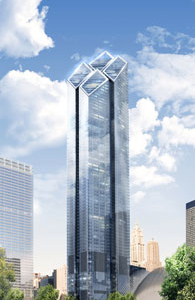 When constructed, the tower will be the second–tallest skyscraper on the World Trade Center site and in New York City, following One World Trade Center. The sloping roof consisting of four diamonds inclined toward the memorial will provide a visual marker around the skyline of just where the original towers were. The tower is designed to resemble a diamond, with cross bracing intersects and indentations breaking up the sides. The Port Authority of New York and New Jersey said the following about 200 Greenwich Street's wedged rooftop: "Designed by Lord Norman Foster, the tower incorporates WTC master planner Daniel Libeskind's 'wedge of light' concept, and will cast no shadow on the memorial park on September 11." The total floor space of 200 Greenwich Street is anticipated to include 2.4 million square feet (220,000 square meters) of office space and another 130,000 square feet (12,000 square meters) for retail shops and access areas to the underground PATH railway. Here's the our members favorite photos of "Skyscrapers near Manhattan". Upload your photo of Two World Trade Center!